Soup Girl, you were busy last year and sent your wonderfully enthusiastic mother in your place to represent you at Barrie's Savour The Flavours Show. 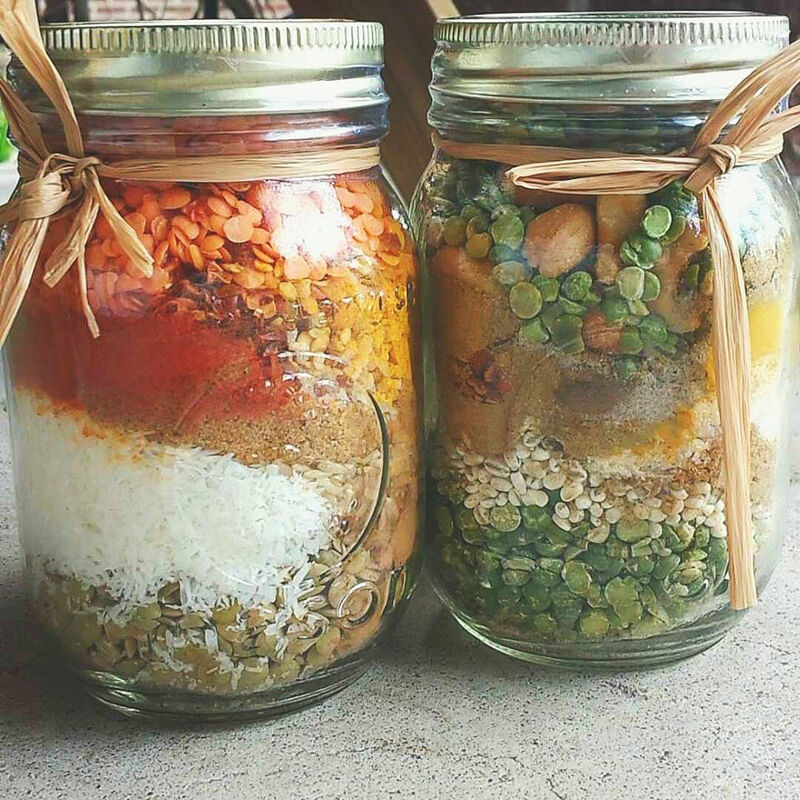 She gifted me two beautiful jars of artfully arranged soup ingredients, and allowed me to choose my flavours - Curried Cashew and Spicy Coconut Lentil. Very soon afterwards, my daughter and I broke out the Curried Cashew and made a delicious lunch with it. Oh oh - I meant to take pictures of that! It was so good that all thoughts of photography and blogging went out the window. So the pretty jar of Spicy Coconut Lentil sat for quite a few months more on a shelf with collector tins, antique cookie cutters and vintage soda bottles. 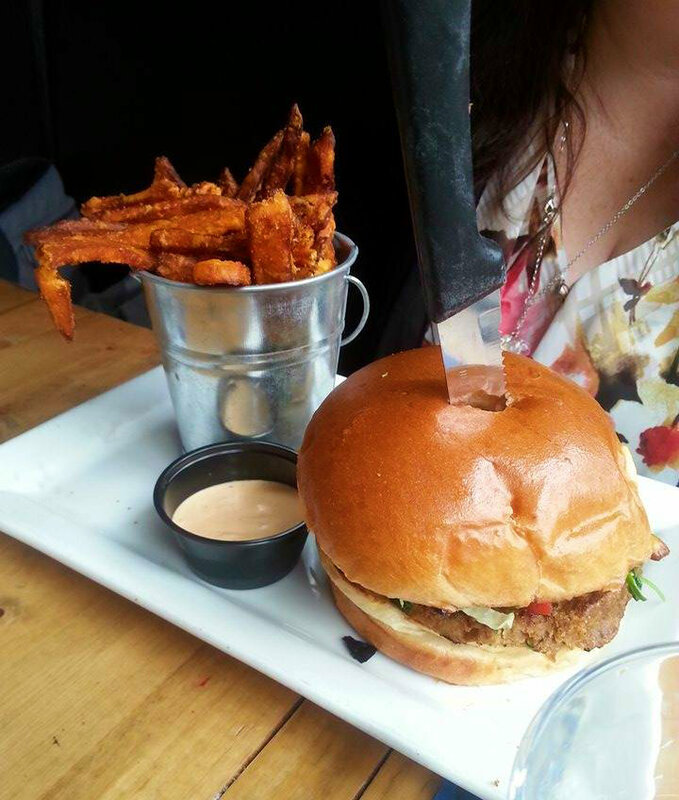 I almost forgot that it was not a knick-knack but actually food. As Savour The Flavours is fast approaching again, I thought I better try out the soup that Soup Mama so kindly gave me. 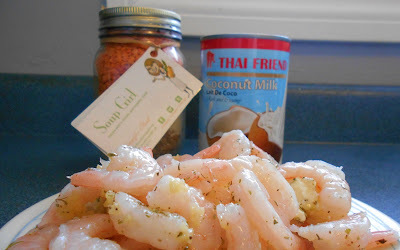 All you really need for this soup is the contents of the jar, water and coconut milk which is optional. The ingredients themselves are vegetarian, made from 75% Canadian ingredients and very high in protein, fibre and iron. This particular flavour contains 2 kinds of lentils, brown rice, unsweetened coconut, sea salt, chili pepper and other spices. 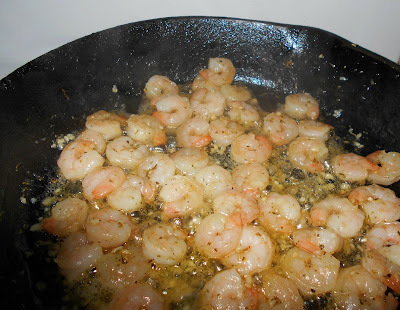 My husband got the idea that shrimp might be a good addition to the soup, so we sauteed some cocktail shrimp in garlic butter ... Heaven forbid an entirely vegetarian dinner! The soup needs to simmer for one hour in order to soften the lentils, so during that time I baked a loaf of artisan bread that had been resting on my counter-top for 24 hours. Fresh bread and hot soup - yes please! Thank you www.itsalwaysautumn.com for my new favourite, ridiculously easy bread recipe. 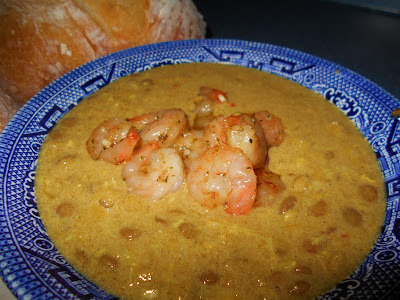 The result was a lovely, creamy and delicately spiced soup. Despite the name, Spicy Coconut Lentil, this soup was not hot at all. Warming yes, but nothing my fair weather, British-bred taste buds couldn't handle - I fully admit that I can tolerate little more heat than the average infant. My husband might actually be worse. So, in the words of Goldilocks, Soup Girl's soup was "just right." Our out of town visitors from Montreal had left for home, so we spent the day with our newly minted city girl daughter who has become an excellent tour guide for the China Town - Kensington Market - Queen Street area in her 2 months of Toronto life. She led us on an adventure through all the funky little thrift shops, record stores and international markets. Our small city senses were bombarded with colourful sights, the sounds of sirens, foreign tongues and street musicians while some of the smells were intoxicating but others an assault to the nose! Up and down stairs into cavernous basement shops, through shabby back alleys where the owners of the Asian restaurants park their Porsche SUVs, and past some questionable looking cannabis markets and massage parlors, we found ourselves ready for some food and our guide girl had just the ticket - a late lunch at the Queen Street Warehouse! 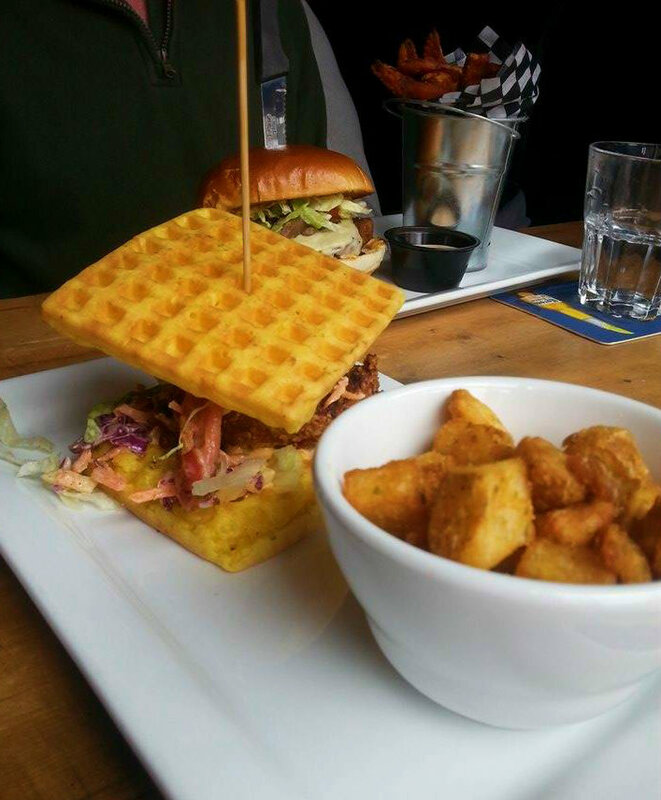 Located at 232 Queen Street West, this well situated little spot is super popular. There are multiple reasons for this but one of the biggies is that every item on the menu is priced at $4.95. Yes, you read that correctly - every item! There are optional upgrades for things like special sauces or sides, but they are priced very low too - $1.00 or thereabouts. We arrived at the right time, just as the place was beginning to get busy. They had just one table left and it was a tiny one right beside the front window. This spot turned out to be absolutely ideal as the view was awesome. The CN Tower rose a few blocks away but appeared even closer while the east wall of the City TV building and its iconic Live Eye truck bursting through the bricks was in right across the street. Soon a line-up of waiting customers formed outside allowing us some great people watching opportunities too. My husband, daughter and I ordered our food and just glasses of water to drink. Our pretty and friendly server, Alison, explained to us that they have a program similar to the Suspended Coffee movement whereby you can order an extra meal for $4.95 that will be brought to Evangel Hall and served to the less fortunate, as happens every Sunday. We ordered one and I was so happy to have the opportunity to do this that I had a hard time fighting back tears. I told her that I am a cook in a soup kitchen in another town and she told us that she is also a social worker. My heart filled up before my stomach did. Eat a Sandwich. Give a Sandwich. We laughed and chatted and thoroughly enjoyed the 1980s music videos on the many TV screens for quite a while. Alison refilled our water a few times and mentioned to us that the kitchen was starting to get backed up. We were understanding of this situation but our experience was becoming slightly less positive until our server came over with an offer we couldn't refuse - FREE drinks or dessert courtesy of her manager (an owner) who said that our maximum wait time had been exceeded. Wow, I was very impressed! Queen Street Warehouse, your points with us just went up again, waaaaay up! We got a red wine, a Strongbow cider and a beer for no extra charge, Nice. Always curious about the recent much mentioned trend of chicken and waffles, my daughter, Margaret, ordered the wafflewich which came with a side order of home fried potatoes. Ron and I got burgers, with mine being a veggie burger, as some of you may already have predicted. Both came on a light and toasty brioche bun with a side of (upgraded) yam fries, as well as a small ramekin of chipotle sauce (also an upgrade). My beautifully done soy based burger was topped with cheese, tomato and lettuce and also some less traditional but delightful items - avocado, green pea shoots, corn salsa and nacho sauce. We all agreed that this was some very delicious food here. My two table mates, a couple of still hungry (all that walking - 11 km in all) turistas, had room left for dessert and ordered a deep fried apple pie with ice cream to share. Where they put it, I do not know! Would I go again? Yes! In the summer months, it looks to me like the side patio would hold as many guests as the interior. 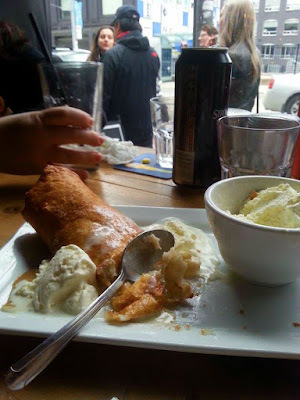 I love a good patio on a warm day and I would certainly be up for another visit to the Queen Street Warehouse.